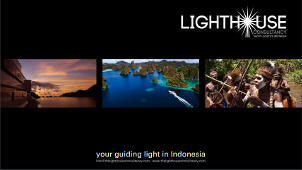 The Lighthouse Consultancy team are based in Indonesia and have been supporting cruising in the country over the past decade. In addition to 360 degree yacht support across Indonesia, the Consultancy also develops personalised itineraries for timeframes throughout the country to truly experience the attractions of the cruising grounds. Here Garry Bevan, a member of the Lighthouse team of cruising guides, describes a week excursion through one of the true wonders of the natural world. Raja Ampat, when translated into English, reads Four Kings and is a region of eastern Indonesia that certainly lives up to its regal name. It is quickly gaining a reputation as being one of the most extraordinarily pristine and diverse yacht cruising grounds on earth. One of Indonesia’s largest national parks Raja Ampat features the large forested islands of Waigeo, Salawati, Batanta and further south Misool which make up the Four Kings. Between these, clusters of smaller emerald topped island groups sit in a clear blue sea that supports a hugely diverse collection of marine life, living amongst a seascape of hundreds of species of colourful corals. Delving deeper into the interior of these islands and waterways, adventurous explorers are rewarded with the wondrous sight of hidden forest fringed lagoons, channels and passages that teem with wildlife, both in the water, on the land and high in the trees. Hold onto your weight belts as we begin a week long whistle stop tour to try and pack in as much of this fascinating wonderland as we can in our short timeframe. A cruise in Indonesia’s Raja Ampat should be high on the wish list of any yacht spending time in South East Asia. Garry Bevan of The Lighthouse Consultancy recommends the perfect charter itinerary. We start our journey at Mioskon, at the south western end of the Dampier Strait, featuring easy anchorages and a wide range of exciting activities, including early morning treks up into the high forests of Waigeo to look for the Red Birds of Paradise performing their ritual mating dances. There are superb kayaking opportunities and secluded white sand beaches, but the major activities here are diving and snorkeling. The signature dive site of this area is called Sardines and at the right time of tide this attracts a mesmerising collection of marine life. The otherworldly Wayag group is made up of a series of shallow aquamarine channels that weave a complex maze around the karst limestone islands, perfect for tender ride exploration. Breathtaking photos of the karst formations taken after an adventurous climb to the top of Mount Pindito have become the trademark image of a visit to Raja Ampat. The waterways seen from this lofty vantage point have become a nursery for several shark species and it’s not uncommon to spot juvenile manta rays cruising on the surface. On the way down to Aljui Bay from Wayag we stop off at Eagle Rock, one of three islets that rise out of the sea to form an exciting dive site that attracts some of the oceans larger creatures. After this refreshing dip we cruise on into Aljui Bay which cuts into the north-west section of Waigeo. This is the home base of the Cendana Pearl Farm and they run well organized and informative tours of their operation, that can also include a wallet draining visit to their retail shop! Aljui Bay is great for extended tender rides around the expansive mangrove forests and there is also some fantastic diving. A dive not to miss here is the Pearl Farm Dock, best completed after dark, when it is possible to spot the endemic Raja Ampat walking shark. This morning it’s time to meet the big boys. Arborek is the collective name for a complex reef system and small, beautifully kept parent island. The shallow reef forms a food trap and acts as a pit stop to a large colony of manta rays. It is one the best places around to get up close and personal with these magnificent animals. Arborek Island has easy access to the local village where the very friendly inhabitants produce a great line in manta ray based straw hats. underwater scenery is phenomenal and undertaking a dive along a ridge, linking one surface rock to another, is not unlike trekking between two mountain peaks. The added attraction to the dramatic marine scenery is the sheer number and variety schooling fish that congregate here, so thick that it seems you are staring at a huge wall of undulating silver. The last day of our whirlwind trip is all about caves. First we will dive the exciting Killer Cave in the Wagmab channel before moving off to visit the large and mysterious cave system at Tomolol. This excursion takes adventurers through cathedral like chambers that extend hundreds of metres back into the limestone mainland of Misool. During our short week in Indonesia’s Raja Ampat we have barely scratched the surface of this incredible region of the natural world. It is a cruising ground that still has ample room for exploration with wonders that await you around every corner, throughout the islands and down in the depths. Armed with The Lighthouse Consultancy’s experienced, professional and dedicated superyacht support, along with their knowledgeable team of cruising guides on board, remote cruising in Raja Ampat, or indeed any of the multiple cruising regions of Indonesia, will live long in the memory of yacht owners, their guests and crew.